Good Art Is Popular Because It's Good. Right? Research suggests that after a basic standard of quality is met, what becomes a success and what doesn't is essentially a matter of chance. What makes the Mona Lisa — or any piece of art — successful? In July of last year, a man named Sidney Sealine went to see the Mona Lisa in Paris. The idea was to spend some time with the picture, see for himself the special spark that made the painting so famous. But Sealine couldn't even get close. In his video of the visit, you see people of every race and nationality crowded around the barricades that separate them from the painting. 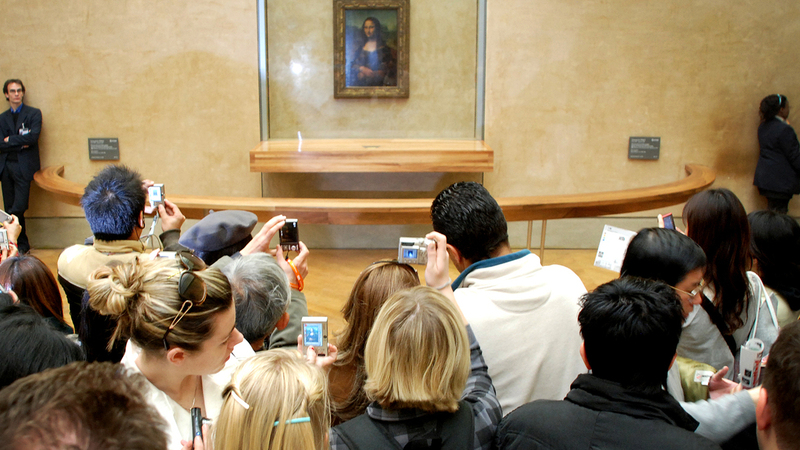 They're holding cameras over their heads and snapping pictures like paparazzi at a movie opening while the Mona Lisa gazes out at them. A surprisingly small portrait, it is separated from the crazed crowd by a series of wooden railings and an enormous slab of darkly tinted bulletproof glass. It's a painting so successful it requires constant protection from the public, and so it can hardly be seen. Why Is The Mona Lisa – Or Any Piece Of Art – Successful? The Mona Lisa is the most famous painting in the world because people believe there is something profoundly special about it, some quality so distinguishing that it deserves to be as famous as it is. Several years ago, Princeton professor Matthew Salganik started thinking about success, specifically about how much of success should be attributed to the inherent qualities of the successful thing itself, and how much was just chance. For some essentially random reason, a group of people decided that the thing in question was really good and their attention attracted more attention until there was a herd of people who believed that it was special mostly because all the other people believed that it was, but the successful thing wasn't in fact that special. It is hard to make things of very poor quality succeed — though after you meet a basic standard of quality, what becomes a huge hit and what doesn't is essentially a matter of chance. People have been arguing about this for years, but it's a hard question to settle because there's only ever one version of reality. "To see the role of chance you need to see multiple realizations of the same process," Salganik explains. "But we only get to see one outcome. So we see the world where the Mona Lisa is one of the most famous paintings, and it's hard to imagine that something different could have happened." But Salganik is good at computers, so he came up with a plan. He would create a series of identical worlds online filled with the same pieces of art, then get thousands of people to choose which they liked best. If the same art rose to the top of every world, then he would know that success was driven by the inherent qualities of that work. If not, he could conclude, success was essentially random. "We have the chance of really seeing — as much as we possibly can — parallel versions of history. So rather than trying to argue like that, we just said, 'Let's just create these parallel worlds and see what happens.' "
To test how much of success should be attributed to chance and how much to quality, Salganik created a website that randomly funneled the 30,000 teenagers he recruited online into nine identical worlds. Each of these worlds exposed the teens to 48 songs from emerging artists — bands that hadn't yet been signed so were totally unknown to the teens. The deal was that after listening to the songs, the teens could download the ones they liked best for free. Now in one world — the control world — they couldn't see which songs their peers were downloading so there was no social influence. But in the other eight, the teens could see which songs had been downloaded before, so they knew what other people thought was good. "So we had the exact same 48 songs competing against each other, we had the exact same initial conditions, everything starts with zero downloads, and we have indistinguishable groups of participants, because they were randomly placed into the world," Salganik says. Different songs become popular in different histories — and not in small ways, either. "For example, we had this song 'Lock Down' by the band 52 Metro," Salganik says. "In one world this song came in first; in another world it came in 40th out of 48th. And this was exactly the same song. It's just in these different worlds, history evolved slightly different. There were differences in the beginnings, and then the process of social influence and cumulative advantage sort of magnified those small, random initial differences." Now obviously there are many different things that have an impact on success and failure — money, race and a laundry list of other things — and after this work, which one person in the field described as a seminal paper, Salganik went on to do similar studies with parallel worlds that suggest that quality does have at least a limited role. It is hard to make things of very poor quality succeed — though after you meet a basic standard of quality, what becomes a huge hit and what doesn't is essentially a matter of chance. Which makes you think — and not just about the role chance plays in what we consider great art, but also about success more generally in our lives. As Salganik says, "I think that if you believe that there's a large role for chance in the outcomes that people have and the kinds of success that people have and also the kinds of failures that people have, it changes how you treat other people." Salganik believes that it makes you treat them better.